Share the post "Catharanthus Roseus, Commonly Known As Vinca"
Catharanthus roseus is an evergreen subshrub or herbaceous plant commonly known as the Madagascar periwinkle or Rosy Periwinkle. It is a species of Catharanthus native and endemic to Madagascar. It was formerly classified in the Vinca genus as Vinca rosea. Common Name: Vinca, Madagascar periwinkle, Rosy Periwinkle, Cape Periwinkle, Rose Periwinkle, and “Old-Maid”. In India the plant is known as sadaphuli meaning “always flowering”. 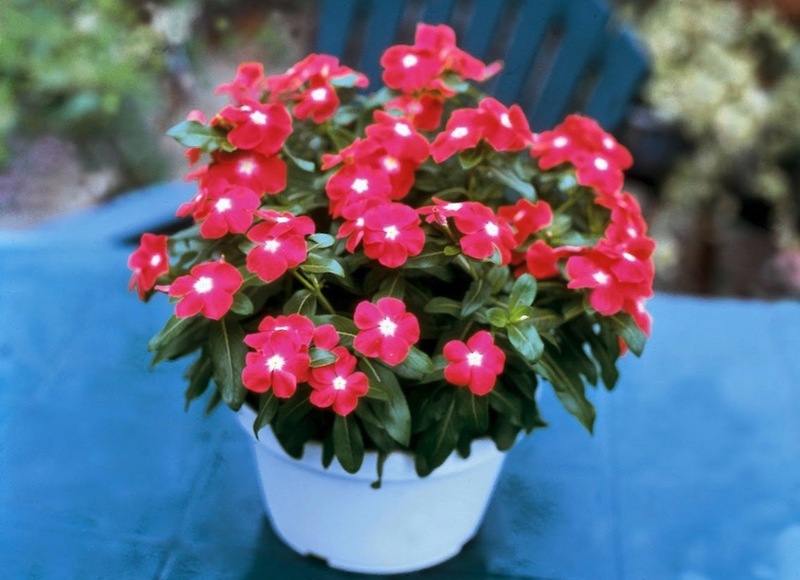 Gardeners choose Vinca (Catharanthus roseus) because it is relatively drought-tolerant and performs well in dry and hot locations exposed to full sun. Whether the summer is dry or wet, hot or cold, vinca plugs along unfazed, but still does best with moderate moisture. It makes a great container plant. Or plant it in a bed or border, grouping at least eight or more together for best effect. Vinca is noted for its long flowering period, throughout the year in tropical conditions, and from spring to late autumn, in warm temperate climates. Flowers come in a wide variety of colors such as red, dark red, white, pink, light pink, and purple. In general, there are three types of Vincas: creeping (spreads 8-10 inches), dwarf (10-14 inches tall) and a border type (bigger flowers and 14-20 inches tall). Two of the species, Vinca major and Vinca minor, are extensively cultivated as a flowering evergreen ornamental plant. Because the plants are low and spread quickly, they are often used as groundcover in garden landscapes and container gardens. They are also traditionally used in older cemeteries as an evergreen maintenance-free ground cover. Many cultivars are available, with different plant, leaf, and flower – colors, sizes, and habits. Although attractive, both Vinca major and Vinca minor may be invasive in some regions where they are introduced species because of the rapid spreading resulting in choking out native plant species and altering habitats. Areas affected include parts of Australia, New Zealand, Canada, and the United States, especially coastal California. Catharanthus roseus has long been cultivated for herbal medicine. In Ayurveda (Indian traditional medicine) the extracts of its roots and shoots, though poisonous, is used against several diseases. In traditional Chinese medicine, extracts from it have been used against numerous diseases, including diabetes, malaria, and Hodgkin’s lymphoma. There are at least 86 alkaloids extracted from plants in the Vinca genus. 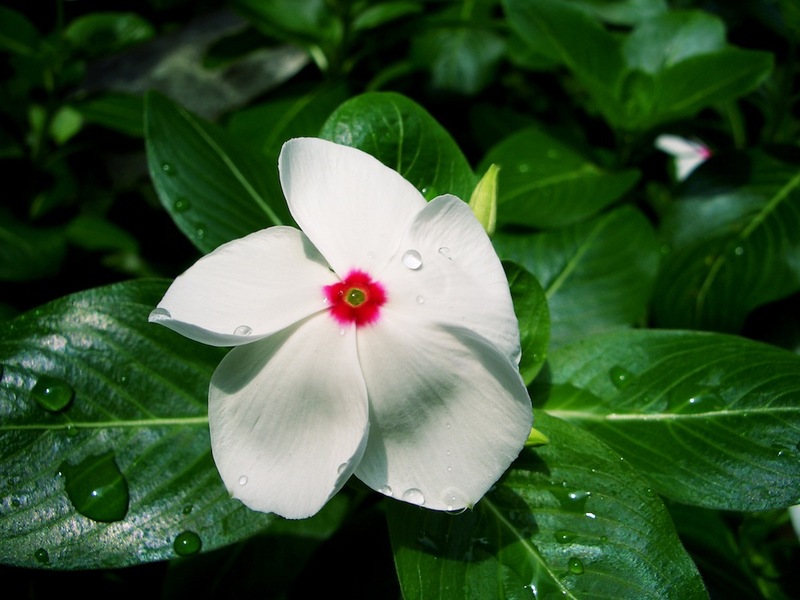 The chemotherapy agent vincristine is extracted from Vinca rosea (current name Catharanthus roseus), and is used to treat some leukemias, lymphomas, and childhood cancers, as well as several other types of cancer and some non-cancerous conditions. Vinblastine is a chemical analogue of vincristine and is also used to treat various forms of cancer. Dimeric alkaloids such as vincristine and vinblastine are produced by the coupling of smaller indole alkaloids such as vindoline and catharanthine. Do you like this plant and have tips to grow it? Please share in the comments below the article! Do you grow Catharanthus roseus (Vinca, Madagascar periwinkle, Rosy Periwinkle) in your garden? What is your experience with this plant? Please share in the comments below! Do you sell Catharanthus roseus (Vinca, Madagascar periwinkle, Rosy Periwinkle) seeds or have plants for sale? You can place your advertisement here. Contact us now!